Venezuela is in crisis (Buxton 2016; Hetland 2016; Human Rights Watch 2018a; Petras 2013). US sanctions and recent calls for a military coup (Cárdenas 2018; Gaouette 2018; USDS 2018a; Wroughton and Alexander 2018) in Venezuela, however, are motivated by geopolitics and oil, not concern for human rights. US sanctions on Venezuela have undercut the country’s oil production (Butler 2018; EIA 2018a; Jacobs 2018; OECD 2018; YCharts 2018a) and starved the country of consumer goods such as food and medicine, creating a humanitarian crisis (Hetland 2016; Rodríguez 2018). Venezuela is a major player on the oil market with the largest proven oil reserves in the world. 95 percent of the country’s export revenue comes from the state-owned oil company (Buxton 2016; OPEC 2018a, 2018b, 2018c). US oil producers have been happy to fill some of the supply gap, seizing on higher global prices and expanding output (EIA 2018b; YCharts 2018b). Viewed in the historical context of US interventionism in Venezuela, Latin America, and oil rich countries (Borger and Bellos 2002; Fuchs and Brown 2017; Paul 2002; Petras 2013; Walker 2011), and in the historical context of American human rights violations domestically and abroad (Human Rights Watch 2018b; Murphy 2004; Robinson 2017; Russo 2016; UN 2018a), US-led calls for interventions in Venezuela on the basis of human rights (Cárdenas 2018; Gaouette 2018; OAS 2018), should be regarded as suspicious and hypocritical. Economic data and history show that what is really driving US-led pressure on Venezuela is the US government’s desire for US-aligned regime change in Venezuela and US control over global oil resources. …we should recognize that dialogue or diplomacy cannot bring a resolution to the Venezuela crisis…the only institution capable of instigating a real political transition in Venezuela is the Venezuelan military. In recent days, it has been reported that US President Donald Trump has internally pushed for a US military invasion of Venezuela since mid-2017 (Goodman 2018). Human rights abuses in Venezuela are deeply troubling and are being examined by the International Criminal Court (ICC 2018). The real motivation behind the OAS report and US-pressure are suspicious, however, because the US government has actively promoted regime change in Venezuela since the election of the socialist Chavez government in 1998 (Martin 2017; Petras 2013; Sharma et al. 2004). The US government also has a well-documented history of undermining socialist governments in Latin America (ex. Chile, Cuba) (Clement 2005; Dunne 2011; Walker 2011). The motivation for the OAS report is suspicious because as they regularly ignore economic and social conditions in other OAS countries (Human Rights Watch 2018b; UN 2018b). The UN’s Special Rapporteur on Extreme Poverty and Human Rights released a report in June 2018 on the OAS’s most powerful country, the US. The Rapporteur found that “40 million live poverty, 18.5 million in extreme poverty, and 5.3 million live in Third World conditions of absolute poverty” in the US (UN 2018b). Add to this that 4,645 people died in in Puerto Rico in the aftermath of Hurricane Maria last year (Kishore et al. 2018), there is a long history US police brutality against black and racialized communities (Human Rights Watch 2018b), the migrant family detention and child separation crisis (UN 2018a), and the current administration’s praise of extra judicial killings in places such as the Philippines (ICC 2018; Kishore et al. 2018). The real reason for the crisis in Venezuela and US sanctions is oil. 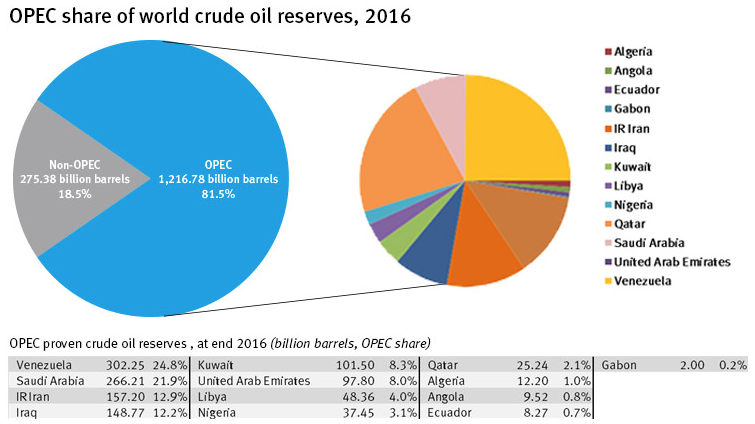 Venezuela is a major player on the oil market with the largest oil reserves in the world at 302 billion barrels in proven oil reserves, followed by Saudi Arabia that has 266 billion barrels in proven oil reserves (OECD 2018; OPEC 2018a). The US sanctions enacted under the Trump administration have not only starved Venezuela of consumer goods (Hetland 2016; Rodríguez 2018), but also industrial goods, under-cutting the country’s oil production (Rincon 2018). Venezuela needs inputs and credit to repair its oil infrastructure and diluent for producing oil. US sanctions are restricting the import of both (Rincon 2018). Venezuela is currently producing about 1.51 million barrels of oil per day, down from a high of 3.45 million barrels per day in 1997 and 2.16 million barrels per day just a year ago in June 2017 (OECD 2018; OPEC 2018a). Currently only about 28 of Venezuela’s more than 80 oilrigs are operating (YCharts 2018a). Venezuela’s economy depends on exporting oil and importing most consumer and industrial goods (Butler 2018; Hetland 2016). US oil producers and other OPEC members have been happy to fill the supply gap left by the fall in Venezuelan oil production (EIA 2018b; OPEC 2018c; YCharts 2018b). Venezuelan oil production is a threat to US oil producers. If Venezuela were allowed to ramp up oil production and sell its oil on global markets it could flood the market with oil, which would lower global oil prices and halt the recent boom in US oil production (Butler 2018). It would also inject cash into the struggling Venezuelan economy and undermine US-led pressure for regime change. Currently, shipments of Venezuelan oil to countries in Asia are at historic lows, while shipments of the relatively cheap US oil to Asia have risen sharply (Cheong 2018; Reuters 2018). Oil production in Venezuela has been unstable since the run up to the oil worker lock out in 2003 (Toledo 2012). The lockout by US aligned Venezuelan oil executives came on the heels of a failed US backed coup a few months earlier (Borger and Bellos 2002; Sharma et al. 2004; Toledo 2012). Oil production stabilized between 2003 and 2015, but has plummeted since 2015. New sanctions have made existing production issues worse (OECD 2018; YCharts 2018a; OPEC 2018b, 2018c; Rincon 2018; Toledo 2012). While Venezuela may have more oil reserves than Iran, unlike Venezuela, Iran has a major industrial manufacturing sector that supplies consumer and industrial goods. Venezuela is more import-dependent than Iran and less insulated from US economic sanctions (IMF 2011; Johnson 2012; Petras 2013; World Bank 2018). In the short run, US sanctions on Venezuela benefit US oil producers by pushing global oil prices higher prices and by opening up demand that would have otherwise been filled by Venezuela and needed to absorb the surge in US oil production (Cheong 2018; EIA 2018b; YCharts 2018b). In the long run, US-led pressure on Venezuela will benefit US oil producers if regime change can usher in the neoliberalization of Venezuela’s oil production (Butler 2018), as it did in Iraq after the 2002 US-led invasion (Paul 2002, 2003; World Bank 2018). The US government can exert influence over the global oil economy by working with or against other oil producing regions. The US is geopolitically friendly but competitive with export oil production in Saudi Arabia, Iraq, Kuwait, Canada and other countries for example (USDS 2014, 2017; Wang and Mirza 2017). The US is not friendly, by contrast, and in competition with, Iranian and Venezuelan oil state-owned oil producers (USDS 2018a, 2018b) – the National Iranian Oil Company (NIOC) and Petróleos de Venezuela, S.A. (PDVSA). Undermining production and market access through economic sanctions, puts economic pressure on the governments of Iran and Venezuela to politically align with US foreign policy demands, and create market opportunities for US based firms (Butler 2018; Cheong 2018). Thus, while human rights abuses in Venezuela are concerning, the reason for US-sanctions on Venezuela and the recent OAS report is the geopolitics of oil. US pressure on Venezuela is part of long history of US imperialism targeting global oil resources that critical geographers like Nayna Jhaveri (2004) and Matthew Huber (2013) have documented and discussed. Jhaveri calls predatory US foreign policy on global oil resources “petroimperialism” (Jhaveri 2004). Huber (2013) links imperialism to the 20th century construction of the “American Way of Life” that the Trump administration’s “Make American Great Again” platform nostalgically refers. Exerting control over oil resources in the Middle East has been a US national security priority since the Second World War and became official US policy in 1980 with the Carter Doctrine (Huber 2013; Jhaveri 2004). With proven oil reserves in Venezuela skyrocketing in the mid-2000s and surpassing Saudi Arabia 2011 (Faucon 2011; OPEC 2018d), all petroimperialist eyes are now on Venezuela. 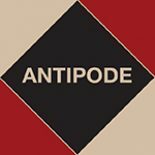 This entry was posted on 10 August 2018 by Antipode Editorial Office in Interventions and tagged Crisis, geopolitics, military coups, military interventions, oil, OPEC, petroimperialism, petropolitics, sanctions, the petroleum state, US imperialism, US oil industry, Venezuela, Venezuelan oil industry.